Apart from entries in the Certificate of British Registry and Lloyds Register of Yachts, we know virtually nothing about ‘Cachalot’ from when she was left in the Mediterranean by the Brigadier in 1956 and 1974 when she came into the hands of Jenny and Ian Kiloh. She had several owners during this period including Hugh Ian Gibson, a Solicitor from London; Norman Frank Dixon, MBE, from Maldon, Essex; David Garber, a London Company Director; Cecil David Richardson, a Maldon Company Director; David Robertson Hiner a Property and Structural Surveyor from Maldon; Thomas Alexander Corbett, a schoolmaster from Hockley, Essex and Andrew Ross Wheatley a yacht broker in Wivenhoe. 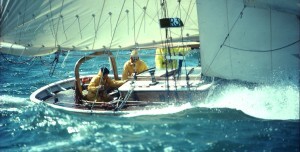 The 1963 Lloyds Register of Yachts lists a different engine: 2 cylinder, 8.5hp, Lister Blackstone 61. Jenny and Ian Kiloh spent many years restoring ‘Cachalot’ and researching some of her history. They lived aboard from the mid-1970s in Brightlingsea, Essex, moving to Heybridge Basin and Suffolk Yacht Harbour, Levington. ‘Cachalot’ had a Yanmar 16hp diesel engine installed and took part in the 1990 ‘Return to Dunkirk’ before being sold to Julia Webb and Martin Davy in July 1991, who also used ‘Cachalot’ as a live aboard.